Clifton Hornets bagged the result of the day in the Poulton and District Primary League, winning 1-0 in the Under-12 Championship against top-of-the-table Thornton Whites. Joseph Baker scored the only goal in a very tight game to secure the points for the Hornets. Oscar Earnshaw and Jake Mangan were on target as Blackpool Rangers Seasiders fell to a 3-2 defeat against BJFF Warriors, losing for the first time this season. Spirit of Youth and Thornton Reds took a share of the spoils in a thrilling 3-3 draw in the Under 12 Premier. Acer scored two for S.O.Y. In the Under-12 Conference, Wyre Juniors beat Layton Juniors 3-2 thanks to Harry Morris (2) and Adam Stafford, with Taylor Davis-Hall netting for Layton. Fleetwood Town Juniors Reds ran out comfortable winners 8-1 against Poulton Town Pumas. Five goals came from Jordan Beavers, with Smallwood, Davidson and Hardingham also getting on the scoresheet for the league leaders. In the Under-13 Premier Division, Layton Juniors ran out 6-0 winners against Spirit of Youth Vipers. Connor Satchell bagged a hat-trick, with Billy Ogden, Corey Foster and Ryan Jones also finding the back of the net. YMCA Under 14s’ Lancashire FA Cup hopes were ended at the first hurdle as they fell to a 3-1 defeat at home to Leyland Albion. The visitors, who are fancied to go a long way in the competition, looked strong and pacy from the off and took the lead in the 10th minute. Their lead was doubled 10 minutes later only for YMCA to reduce the deficit just before half-time through Josh Dolby-Armstrong. The second half remained a hard-fought encounter but another Leyland goal restored their two-goal advantage and they were able to see out the rest of the game. In the Lancashire FC Cup, Clifton Rangers Under-14s won 6-5 in a thrilling encounter at Turton FC. Oliver Shaw and Joe McGuirk grabbed two each, with Jack West also getting his name on the scoresheet. YMCA Under-15s remain winless after a 6-2 defeat at home to unbeaten champions Thornton Reds. YMCA started the game brightly and took the lead through a superb taken free-kick by Jake Molloy. However, Thornton scored three before half-time, adding another three in the second half as they remained in control. The hosts notched a late consolation from Taylor Stott. In the Under-16 Premier, AFC Fylde beat South Shore 5-1. AFC raced into a 5-0 half-time lead with debut goals for Sheldon Green and Owen Watkinson, who went on to score his hat-trick. Luke Sevens also scored. South Shore came out fighting in the second half and reduced the arrears. And finally, Clifton Rangers beat Fleetwood Gym 9-0, with goals shared between Alfie Tomlinson, Jamie Hargreaves, Josh Smyth, Jake Dennehy and Jack Arrowsmith. Foxhall Under-16s climbed to top of the table in the Gold Bond Blackpool and District Youth League with a dominant 6-0 win against Warton Typhoons. But the game of the day saw Lytham Juniors Home Heat go second after a thrilling 6-5 win at Spirit of Youth. On a sunny afternoon at Common Edge, Lytham started the better and were two goals to the good after just five minutes. Kai Clarkson-Lowe finished well and Alex Price netted from a direct free-kick. Lytham wasted several chances before Spirit scored twice in quick succession to level the scoring. But a fine move was finished by Daniel Pilling to give Lytham a 3-2 half-time advantage. Lytham scored the opening two goals in the second half to give them a 4-3 lead only for Pilling to score his second to get his side back on level terms. Josh Serghi then put Lytham in front once again. A penalty gave Spirit an equaliser just 10 minutes from time but a last- gasp goal from Alex Price handed Lytham a dramatic late win. Kyle Townsend (2), Robert Flanagan, Nathan Tolley and Theo James were on the scoresheet for Spirit. A Kyle Wylie hat-trick set FC Rangers on their way to a 4-2 win over Kirkham. Danny Eccleston also scored for Rangers, with McLeod and Critchley replying for Kirkham. St Annes Greens beat Layton 7-2 thanks to goals from Kev McGow (2), Liam Booth (2), Lucas Kilgallon, Nathan Chase and Tom O’Neil. Aiden Williams and Lewis Lavery scored Layton’s goals. Sydney Sullivan, TJ Phillips and Michael Finch scored as Poulton beat Blackpool Rangers Seasiders 3-1. In the Under-18 section, Foxhall are joint-top after Aaron Waterfield’s brace and goals from Conor Smith and Ben Cardwell gave them a 4-3 win over Fleetwood Town. Foxhall Hoops won 6-2 at St Annes, Liam Markey leading the way with four goals. Dan Holt and Adam Warrington also found the back of the net, while Oli Pitt and Matt Van Wyk replied. Fleetwood Town Rangers beat St Annes 5-0. In the Under-13 Alpha Gold division, BJFF Blades had the perfect start with a 9-0 win against Foxhall. Goals came from a Ralf Newton hat-trick , Spencer Phillips (2), Matthew Finney (2), Donny Barrat and Harrison Giggal. YMCA suffered their first defeat of the season as they went down 2-1 to Squires Gate. YMCA went into half-time 1-0 ahead thanks to a goal from Archie Hingley only for Gate to net two in the second half the winner coming in the dying moment. Matthew Kelsey and Imaan Hussain scored the goals for Gate. Fraser Hallas scored a hat-trick as Thornton Cleveleys Reds beat Poulton 4-1. Jack Birchenough was also on target and Nico Cobb replied. In the Under -3 Alpha Silver division, Layton missed out on the chance to extend their lead at the top as goals from Jack Iddeson and Brett Higginson earned Kirham Reds a 2-2 draw. Karl Pachecho and Charlie Strachan were the goalscorers for the league leaders. Ryan Beck and Harvey Hampton gave BJFF Viper sa 2-0 win against Thornton Cleveleyes Whites. Connor Satchell scored a hat-trick to help Foxhall Hoops to a 5-2 win over Lytham Blues. Liam Ruddy and Joshua Harris were also on target, with Finley Hurley and Erik Zogo replying. 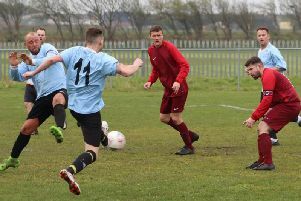 Kallum Illingworth scored a hat-trick for Lytham Maroons but it was in vain as they lost 5-4 to FC Rangers. This was largely due to Matthew Guy’s four-goal haul. Kyle Costin scored Maroons’ other goal and Ryan Henson netted Rangers’.